Those Florida pictures will have to wait. Old Man Winter decided to visit central Ohio this week and we met him with open arms. There was plenty of bee work to attend to, but with the snow, fun took first priority. See ya, Bridger! Hey, take a look at those bees while you’re back there. But who am I kidding? Intentional or not, fun takes first priority all the time. Such is beekeeping. I’m in love with my job and I’m in love with my millions of coworkers. Even in the winter. This week I visited all the girls. The snow made it more difficult, but I think they needed checked. The really nasty weather is still to come. Just the very top of what I hope is a big nest. 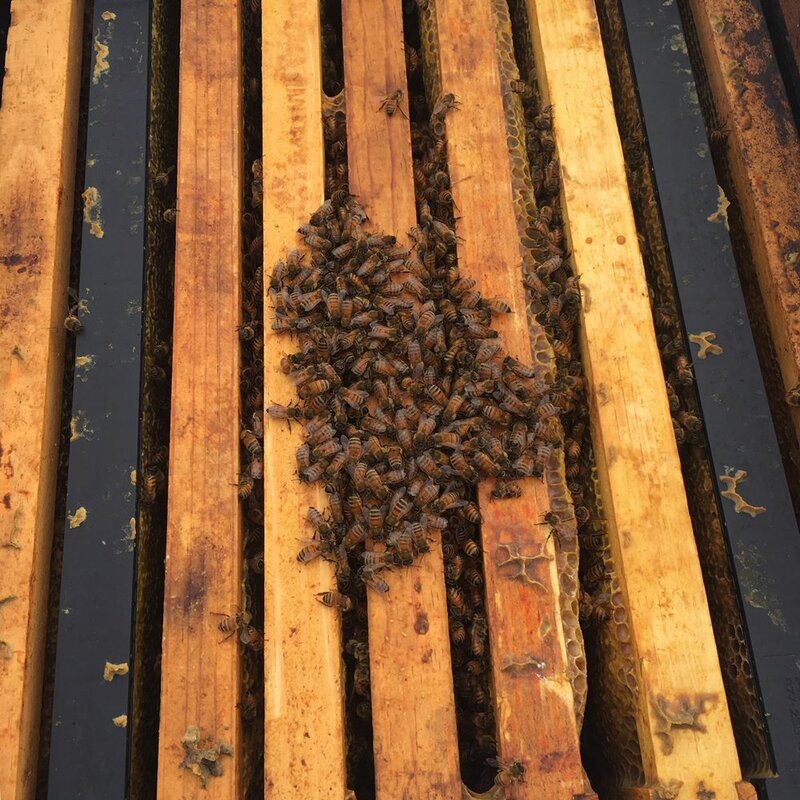 The clusters are working upwards, and although there is obviously still plenty of honey, it won’t hurt to put on a patty or two just for insurance. It was quick and easy. Seconds per hive. …Except for a couple yards where I didn’t get around to placing the spacer in December. Here, the snow presented more of an obstacle. Winter feeding. A lonely, quiet, contemplative job. Exactly the kind I like. Very little radio or podcasting or Facebooking went on this week. The snowy silence provided ample satisfaction. Complete with visuals and background music. I thought it was more fitting for this blog, but if you want the 22 minute full version, it is well worth the time. Maybe the best 22 minutes you’ll spend all week. Winter is a good time to ponder stuff like this. The bee suit becomes insulated coveralls, the thin gloves have become thick, the work boots are now waterproof snow boots. Wow! You can see that these girls are a bit confused as to what season we’re in. ‘38 degrees! It must be June!’ They were fed a month ago, and they’ll need continued calories as we go through winter. They already had two full frames of brood, and why they think it’s spring, I don’t know. Are they stupid? Or just overly ambitious? It’s a mystery to me… maybe one in fifty look like this. Which gives me ten or twelve reasons to make it around in the snow. Sometimes it’s not the most enjoyable, frozen fingers and toes, lugging feed, getting stuck… but it has some rewards. Almost aways, I finish up listening to the low hum of bees. In every yard there are one or two noise makers. I’ll never know. But whatever they’re saying, it makes me happy. This is winter. And they’re saying something.